The past week went well and didn’t seem as overwhelming as it could have easily been. I followed Lori, the interim pastor, around as she did visits, led worship services at the care center/assisted living facility in town, attended staff meetings, and met lots of people who’s names I now have forgotten. The pastor of the church, Kendall, is on sabbatical for the months of September and October, which puts me in an interesting position, spending the first two months of my internship with the interim pastor (who happens to be the intern pastor from last year). Confused? Me too. I participated in leading small parts of the worship service yesterday. I was a bit nervous, not necessarily for speaking in front of the congregation but I hate those pocket mics that you have to switch on and off. I always think I’ll mess that up but not yesterday. Phew. I will be leading worship in some sense every Sunday; I will either but leading the service or preaching. Never both off the bat but always one or the other. After church I drank some coffee with some sweet old ladies who invited me to join their table and was introduced to more people I can’t quite remember. After church, I came home to my apartment and then shrugged my shoulders, wondering what the heck I would do with the day. I was bored out of my mind. No internet. No sewing machine as of yet. Totally unpacked and unloaded. I took a two hour nap … watched That 70s Show … read a bit … and that pretty much sums it up. Yesterday I think I came to the realization that this will be a very lonely year for me though I know that busy-ness at church will help a lot when I don’t have time to feel alone. 1. I had estimated that there are 17 gnomes in the garden. Turns out there are 28 gnomes! What a gnome-tastic surprise! Not to mention, there is a map to indicate which gnome is where and the gnome’s name. 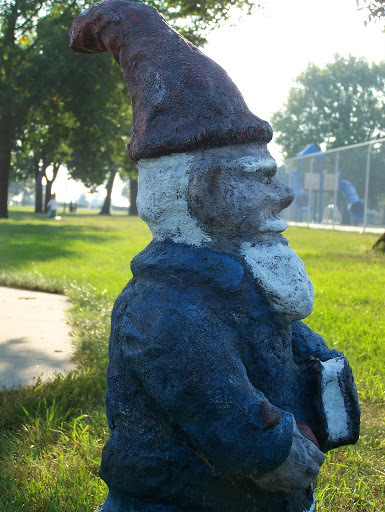 Apparently, every summer there is a festival in Dawson in which a person in the community is honored an then there is a gnome made and put in the gnome garden in honor of that person. 3. Some gnomes have had unfortunate accidents, which may or may not be the result of reckless teenagers who are bored and can think of nothing else to do but steal innocent gnomes and throw them in the river. (Bored in Dawson? I can’t imagine. sarcasm) Take Gladys here. Only her gnome feet remain. Poor Gladys. On my morning walk this morning, I documented the gnome population in the garden and hope to bring you occasional gnome profiles of the gnome people who call Dawson home. In my three years in MN, I never have really noticed the accent. Maybe I grew accustomed to it or maybe just gained it myself and therefore didn’t realize it when other people spoke with ridiculously long o’s. But, my goodness, have I noticed one thing since I’ve moved to Dawson – the for. The for goes in front of anything. Anything. Attach a description word and you’re set. Oh, for goodness sake, I have noticed it coming out of ladies’ mouths left and right. For awesome. Jesus is four and a half feet tall and we share an office at Grace Lutheran Church. Please do not compare your work to the work that he does. Oh for cute! He wants to hug you and hold your scarves! 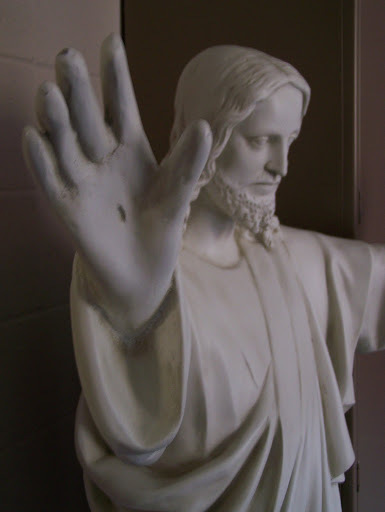 I’m all for Jesus but I would be little creeped out by sharing an office with that statue. We’re getting along pretty well so far, hopefully the cordiality keeps up. Apparently Jesus belongs in the cemetery but first needs a base to stand on which hasn’t been completed. I don’t know, I’m okay with sharing an office with him. I’ve been told he’s the way, the truth, and the light. And I think he loves me.